Prepare the pastry shells according to the package directions. Place 2 slices corned beef into each pastry shell. 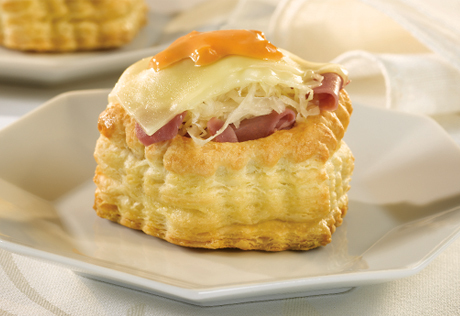 Top each with 1 teaspoon mustard, 1 tablespoon sauerkraut and 1 piece cheese. Bake at 400°F. for 5 minutes or until the cheese is melted. Serve with the dressing, if desired.